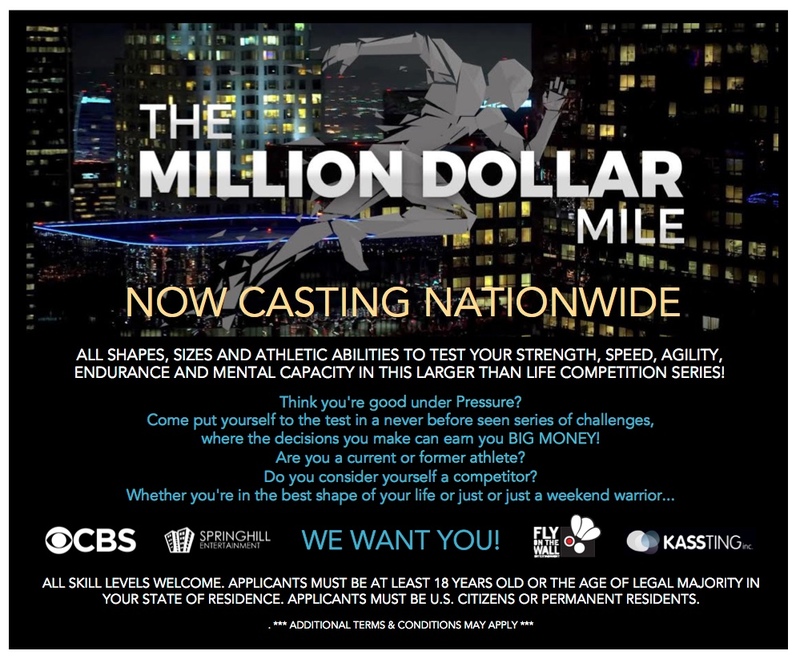 Million Dollar Mile is a new and unprecedented 10-episode competition series, where everyday athletes’ physical and mental toughness will be tested like never before—with an opportunity to change their lives forever. After shutting down the streets of a major city, the Million Dollar Mile course goes up! At one end is the contestant, and at the other, a whopping $1,000,000. Standing in their way? The most challenging course ever designed and a group of elite athletes with one mission: stop the contestants from winning the money at all costs. Think you’re good under pressure? Come put yourself to the test in a never before seen series of challenges, where the decisions you make can earn you up to a MILLION DOLLARS! Are you a current or former athlete? Do you consider yourself a competitor? Whether you’re in the best shape of your life or just a weekend warrior, we want you! NOW CASTING all shapes, sizes and athletic abilities to test your strength, speed, agility, endurance and mental capacity in this larger than life competition series! All skill levels are welcome. Must be at least 18 years old or the age of legal majority in your state of residence. Applicants myst be U.S. Citizens or Permanent Residents. This casting notice was posted by: Kassting Inc.